The University of Cambridge’s Institute for Manufacturing (IfM) is a partner in a £5 million research collaboration that is set to revolutionise the UK’s internet infrastructure. In a future where people want more things in their lives to be connected, IfM’s expertise in the Internet-of-Things and cyber physical systems will be a key contributor to developing the next generation internet (5G) in a national digital telecommunications infrastructure project announced today. The next generation 5G network will not only deliver faster speeds, it will also enable the internet to be used in completely new ways with driverless cars, smart-homes, telemedicine, precise remote-control of drones and virtual reality reaching their full potential. Jointly funded by the Engineering and Physical Sciences Research Council (EPSRC) and telecommunications company BT, the Next Generation Converged Digital Infrastructure project brings together multidisciplinary researchers from the University of Cambridge (IfM and the Judge Business School), Lancaster University (project lead), University of Surrey and University of Bristol. IfM’s Distributed Information and Automation Lab (DIAL) will help make a radical change in the way networks perform and are maintained by bringing its expertise in the Internet-of-Things and cyber physical systems, together with its research within the Cambridge Centre for Smart Infrastructure, to the project. Dr Ajith Parlikad, Senior Lecturer at IfM’s DIAL and leader of the Cambridge arm of the project says: “This research will improve the resilience of the UK’s digital telecommunications network. Customers will benefit from an enhanced service and improved reliability, with the new network also providing increased capability to adapt and respond to the introduction of new ICT services. 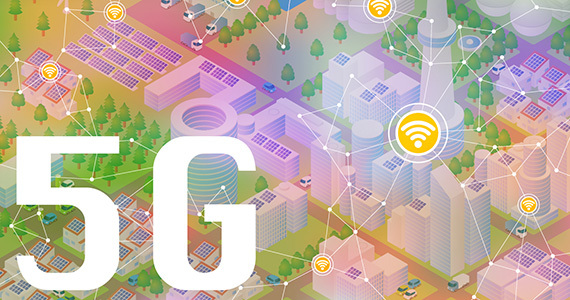 “The 5G network of the future needs to be super-resilient and super-adaptable to changes in demand for it to be a key enabler for the wider exploitation of digital technologies in infrastructure. To do this, the network needs to be able to operate autonomously so that it can react and even predict changes in networking demand and be able to reconfigure infrastructure with minimal human intervention. The University of Cambridge will receive £1.5 million to undertake its part of the project, which will also fund three new PhD students. Also working on the project is Professor Duncan McFarlane, Head of DIAL, and Dr Philip Stiles, Senior Lecturer at the Judge Business School. The Next Generation Converged Digital Infrastructure project is part of a new set of Prosperity Partnerships, which will receive £31 million of government funding from the EPSRC and the Industrial Strategy Challenge Fund (ISCF) - this will be matched by a further £36 million from partner organisations in cash or in-kind contributions, plus £11 million from universities’ funds, totalling £78 million in all.